Created in 1990, Nose to Nose brings together our diverse experiences in the fields of theatre, community building, teaching, storytelling, play therapy, counselling, Special Needs and organisational consultancy. Our influence and training ranges from The Bataclown (France) and the Roy Hart Theatre. We are committed to small group sizes - 12 participants - and to a person-centred approach that is respectful of each individual’s path towards discovering his or her own clown. 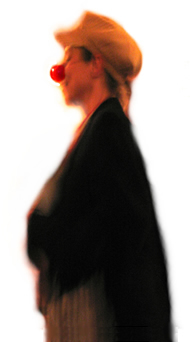 The training essentially reflects our approach and philosophy of teaching clowning. It provides a practical and experiential grounding in the facilitation process. It is a two-year course (from September 2019 to August 2021). Each year consists of three 4-day residential modules (Thursday morning to Sunday afternoon) or six modules over two years. Online supervisions are also planned between each module (to be decided by the group). A further supervision period of two weekends per year 2021 to 2023 is also offered for those who wish to deepen their practice of the work. Our courses are programmed to offer you a clear progression through our work - Clown 1, 2, 3, Performance and Social Clowning. We recommend that you take at least two years to complete this progression but it can take longer.